I found out about Love My Tapes from your blog. I have a few rolls, but NOT NEARLY ENOUGH! Laugh! I'd love to win. Beautiful layout-love all of the layering!! I think he sounds like a fun old guy...love the handwritten note...and yes your washi does look like a Levi's rag! Love your beautiful layout and the added Levi tag made from washi tape! So clever! Amazing page Mary Ann!! I love the combination of the Blue and Red together and the photo placement is really awesome!! Your use of the Washi tape gives the layout just the perfect amount of pop! What a wonderful layout! I am now following your blog - after finding it from a link with the blog hop! Can't wait to see more! What a fun layout! Love the Levi tag! LOVE that Levi tag! So creative! WOW this is so awesome love the photos! LOVE the vintage look of your layout ! Great way to display such precious photos. 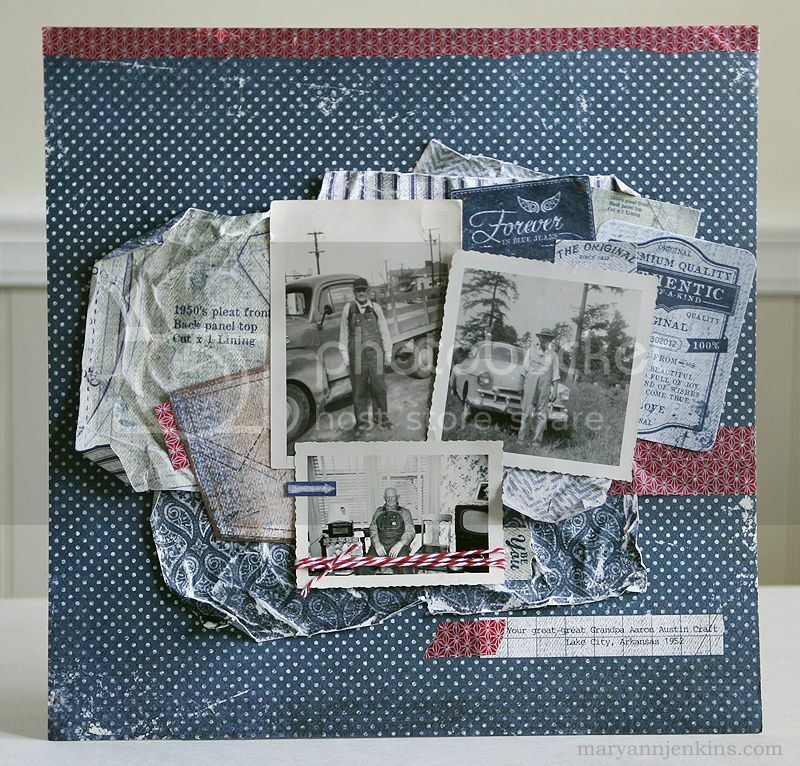 Love the texture from crumpling the papers - great layout here and over on the LMT blog! Really enjoying this hop (and already a follower). Love the layout! the levi tag idea is so clever! Sweet layout! I love the vintage photos! The photos are just perfect, really great page and the touch of red adds a nice drop of color. Love that little "Levis" tab ! Became a follower of your blog. That is the cutest layout! Reminds of my grandpa AND my dad. Love this layout of you great-great Grandpa. Perfect papers and great use of washi tape. Wow love the layering on this LO, and I really like that red washi! Makes me want it! LOVE the little tag--so cute and appropriate!! What a wonderful layout! And I really got a chuckle out of your Grandpa in his Church overalls!! Love the way your tape looks like a fabric tag! I'm a new follower and look forward to seeing all your projects! Great layout! I love the distressed paper and the hits of red washi tape! love the touches of red tape! Joined your blog, too. Sweet story for a wonderful LO. I became a follower, I kile your work. Thanks for the chance to win. Love the idea of using the tape for the tab! Great layout! I'm a new follower! Wow! Love your vintage layout. The tag on the pocket.....so clever. Hope you don't mind if I copy your idea. Very happy to be a new follower of your blog! Thanks for the chances to win. 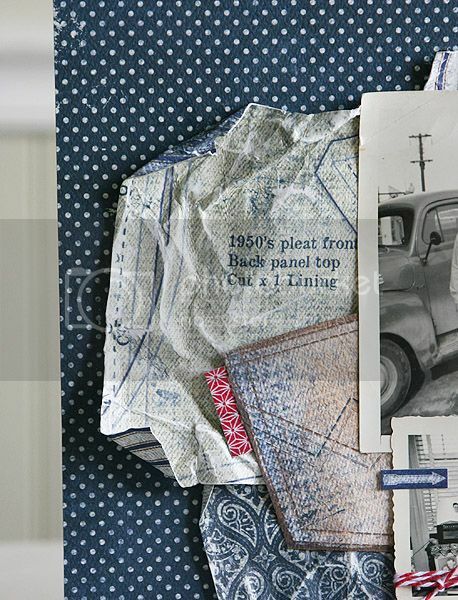 I love your "levi" tag use of the washi and those layers of blue for the layout are perfect! What a beautiful layout you made. I love the distressed papers and the fun story behind the photos! I am a new follower and I LOVE washi tape! awesome layout..i love the vintage photos...so pretty.. Cute layout and the use of the red tape as a tag is great! I just became a follower of your blog. I love the notes about your grandfather and his good overalls. I recently went through all of the old family photos and one of the best parts were all the handwritten notes. Thanks for sharing. Great use of the tape and I love all the texture! Love your LO! Love the picture and the idea of "good jeans/overalls" for church! I'm a new blog follower! TFS! I can't wait to see what you share next! Very cute and such a great job of layering, Love the added tape to make it look like levis. Great job and so fun. Following! I love your layout- perfect for those pictures- so special to document those memories! I love this, great tribute to your grandpa! I just followed your blog, but I've been a fan for a while now. :-) Thanks for this giveaway!